We just received our stock for Battlefield 5 Beta CD key for Origin, You can activate your key now to get Battlefield 1 Weapon Pack. Get into "BATTLEFIELD 5 EARLY BETA ACCESS" late in August or early September. The advantage of the key is that you're will be into a game weeks or two before they release OPEN BETA TO ALL. You will also get unlocked bonuses of wepons with - Special Solders Sets of Outfits. Be one of the first on the frontlines and witness the new #BFV #WW2 - as you've never seen it before. 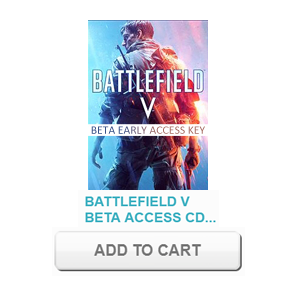 This product is a brand new and BATTLEFIELD V CD Key BETA ACCESS CD KEY FOR ORIGIN. After your payment, you will receive an unused key, which can be entered into the publisher Website in order to get a full Origin of the game. Check the Amazing Battlefield 5 GamePlay Video.